On April 2nd 2009 I wrote a post about a scam product claiming to stop snoring by stimulating acupressure points. 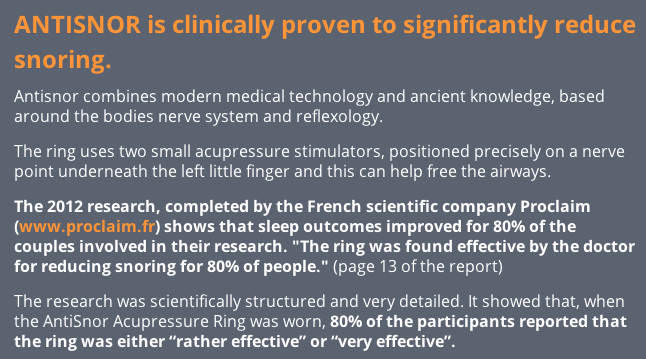 One ring to rule them all… looked at the AntiSnor “acupressure… modern miracle” that could boast of 140,000 satisfied customers. The post originated on the Atheist Age blog and fortunately attracted some comments from a David E. Woodley. According to David there were some conflicting details about the ring’s inventor John R. Woodley – David’s father and, “our greedy and selfish and underhanded little brother John V. Woodley” or ‘Golum’ as he is affectionately called by family members these days”. This had led to two separate stories as to how the power of this ring was discovered circulating in the public domain. 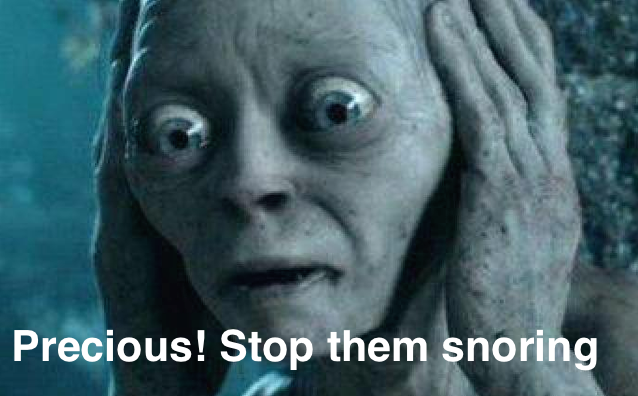 One story was that John Woodley, aka Golum had made the ring in an attempt to find pain relief following a car accident. The other story was that John Woodley Snr. had made the ring for his wife. She was heading to hospital and needed to control embarrassing snoring. Clearly a magic ring was in order. That I’d chosen the title, “One ring to rule them all…” and then found out later that he who coveted ownership of The Precious was nicknamed “Golum”, was indeed delightful. Or perhaps testimony to the limits of my imagination. Misleading advertising claims about an alleged anti-snoring ring have been withdrawn by the manufacturer and supplier after Australian Competition and Consumer Commission intervention. More than 200,000 consumers worldwide are understood to have sought relief from the Anti Snor Therapeutic Ring which the supplier, ATQOL Pty Ltd, claimed used acupressure to stop a person from snoring and provide a relief from sinus, restless sleep and insomnia. The ring was sold at most major chemist and health store chains in Australia and promoted through national television advertising and the company’s website. 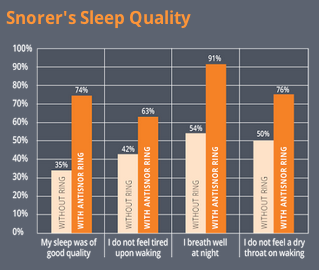 Additionally, the company’s website, www.nosnor.com, claimed the ring had a ‘proven history of successful drug free treatment of snoring’ and was ‘Tested and recommended by a Physician’. The ACCC raised concerns that these claims were likely to mislead consumers to believe that the product had proven medical outcomes in treating snoring, sinus, restless sleep and insomnia when this was not so. It was claimed in 2009 that this modern miracle works because the little bumps apply “pressure on key points on the surface of the skin to stimulate the body’s natural self-curative abilities. The two prongs on the inside of the Antisnor Therapeutic Ring press on the heart meridian and the sterling silver metal also gives energy to this channel. Wearing the ring increases energy flow to what is referred to as the upper jiao, which contains the heart and lungs. 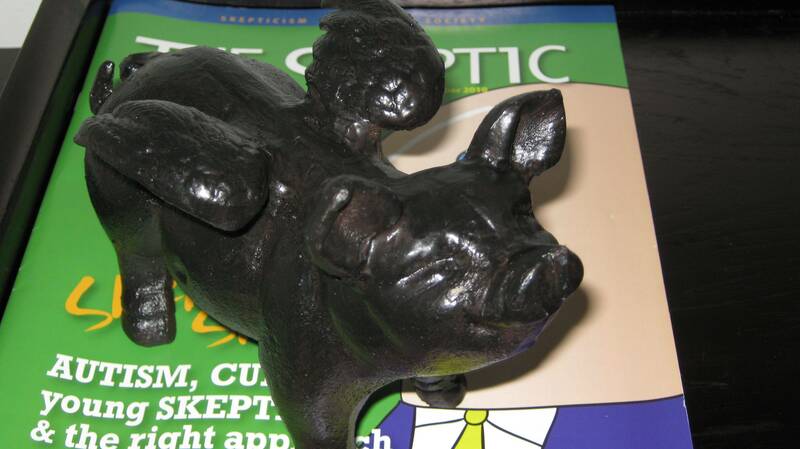 This allows for improved breathing, which leads to the cessation of snoring”. Yes. 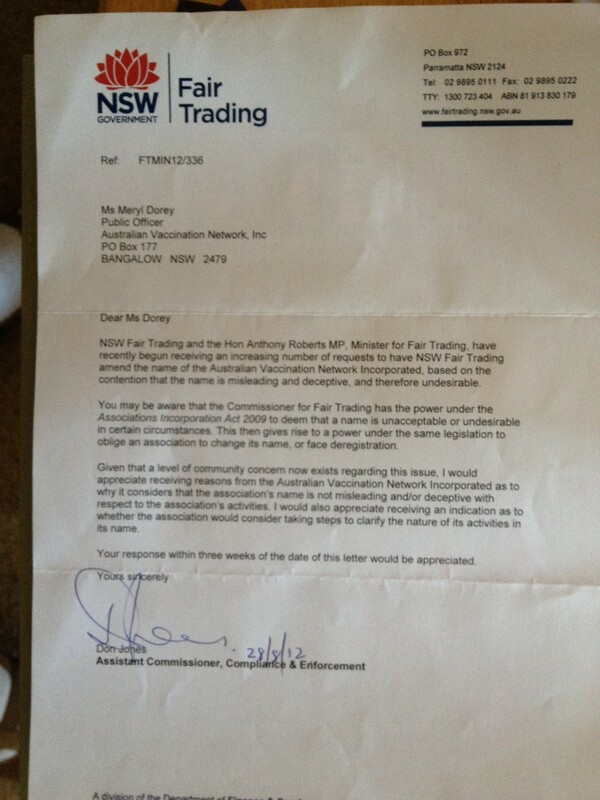 The ACCC were onto something to be sure. Pharmacy News confirmed that the manufacturers of the “deceptive” One Ring had complied. 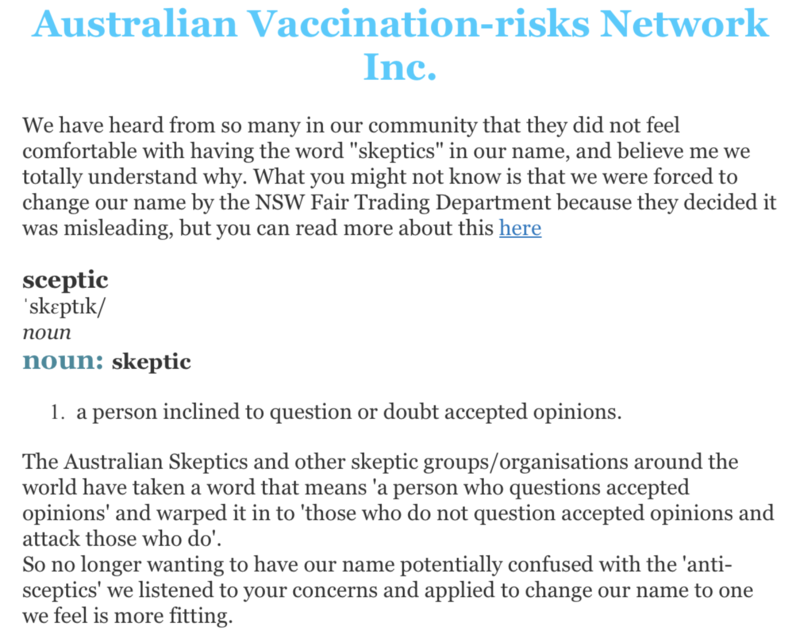 In 2011 Choice listed AntiSnor amongst “quack” health products pharmacies sell. A year ago Choice included AntiSnor amongst it’s collation of dubious pharmacy-sold products. After a two year filing process in 2012 the ANTISNOR Ring was given an exemption snoring device sold over the counter by the USA FDA. A visit to the site confirms that the registration of TGA listed products in Australia still benefits the sponsor of these products more than consumers. 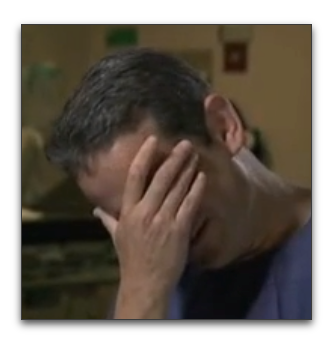 Despite the fact that testimonials are not evidence and there is no evidence of a control group – or indeed the much touted study itself – readers are informed this very same product is now “clinically proven” to reduce snoring. Somehow it even involves “modern medical technology”. The link to “articles” takes readers to blurbs crafted to support the logic of an “acupressure” ring. Presently the ring remains on sale in Australian pharmacies and consumers are offered testimonials as evidence of efficacy. When we think of chiropractic and Equidae, it’s usually unicorns that come to mind. The search for the chiropractic subluxation has been as fruitful as the search for the unicorn. In fact perhaps less fruitful, as we know with a high degree of accuracy what the unicorn looks like. Yet with the chiropractic subluxation our fairy tale is limited to conjuring mystical malaise or blaming dastardly disease as the work of this elusive evil. Do not be alarmed. This man has not seen a unicorn. involve some type of “static” in the spinal cord. after his palm was removed from his face. Interestingly enough, whilst chiropractic teaches that areas of subluxation are invisible and can be “detected” only by the presence of symptoms, Simon Floreani, erstwhile president of the Chiropractors Association of Australia, has other ideas. You can read more about the Sonic Screwdriver-like Activator here in The Medical Observer. Just be prepared for some tongue in cheek observations. In September 2011 it was reported in Australian Doctor that the Federal Government had been asked to investigate both the Activator and “the Nervoscope” as they had been reported as having, “no biomechanical or physiological effect and cannot diagnose or treat any health condition”. Fortunately, whilst new-age chiropractors continue to push their ineffective devices, practices and claims onto an unsuspecting public, genuinely motivated supporters of evidence based medicine are busy exposing their scams. Check out the videos below to see just how devoid of facts claims made by the resurgent followers of Daniel David Palmer, really are. 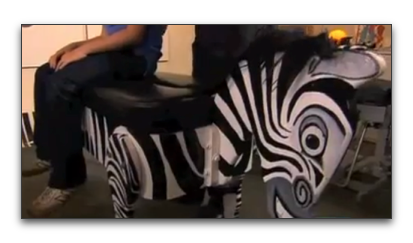 And keep an eye out for Simon and his zebra. 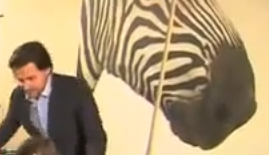 Floreani’s penchant for cutting his own path may help explain why he has chosen the zebra over the unicorn. President of Australian Skeptics Victorian branch, Terry Kelly, chats to host of The Skeptic Zone podcast, Richard Saunders about this years National Convention. 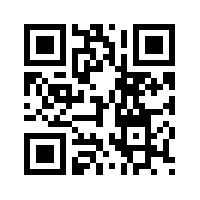 You can listen by visiting the AuSkepCon chirbit page. This years Australian Skeptics National Convention looks set to cover a huge range of topics. Active skepticism – changing for the better is the theme, and subjects involving skeptic and science activists and advocates loom large. Anti-vaccination, non-evidence based alternatives to medicine, attacks on medical science, science and reason itself will feature during keynotes and panel discussion. Consumer scams, regulation of therapeutic goods, dodgy new age diagnostics, the changing role of social media, upcoming challenges and changes and more, more, more. Along with Aussie favourites such as Ken Harvey, Dr. Rachie, Richard Saunders, Adam vanLangenberg, Lynne Kelly, Chrissy Wilson, etc will be James Randi, D.J. Grothe, Brian Thompson, Rebecca Watson and more. Grab all the details and ticketing information from the video below and remember to keep up with developments. Dates: Friday November 30th to Sunday December 2nd. More information at Victorian Skeptics. AuSkepCon is on Facebook and you can follow @auskepcon on Twitter.